Twas the night before my Christmas vacation, when what to my wondering eyes did appear, but a tweet from Victory and the promise of oak aged beer. 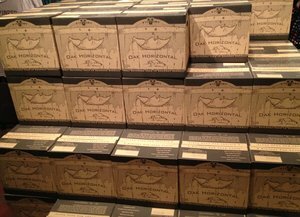 I sprang from the cubicle, visions of caged and corked bottles dancing in my head, and dashed to the brewery in my horseless sled. Uh, yeah, so a poet, I am not. And this isn't even technically a Christmas beer! For shame. I beg the forgiveness of Clement Clarke Moore. 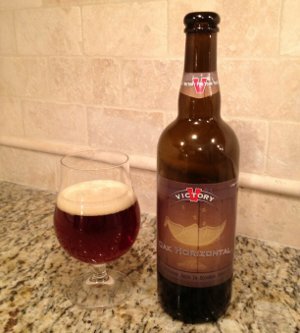 But Victory's Old Horizontal is a winter seasonal, a big, strong barleywine that's perfect for the season. Due to capacity issues, Victory actually hasn't brewed any of that base beer for the past couple years, much to my chagrin. This year, Victory "bribed" their brewers to put in extra hours and make up a batch, but instead of simply releasing it, they chucked it in Bourbon barrels for three months. 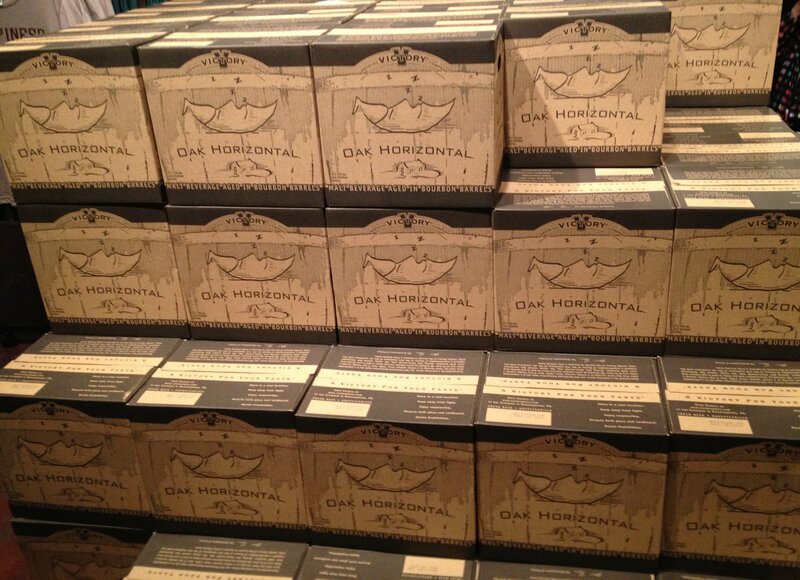 This barrel aged version was dubbed Oak Horizontal, and it was released just two days ago. I would put this beer on par with Weyerbacher's most excellent Insanity, another barrel aged barleywine that's got quite a following. Will be curious to see how the beer nerd community responds to this one. In other news, my cellar is growing unwieldy again, so I may need to chill out for a bit and drink some of that down. Lots of exciting stuff down there, though, so you'll have some interesting reading/jealousy issues coming. But ohh, the BA Eclipse beers were just released. Dammit. And soon enough, Victory will be releasing White Monkey. Golden Monkey was one of those formative craft beers for me... it's a beer I'm almost scared to revisit at this point... but I am curious to see what the white wine barrel aging will do to it. Perhaps a double feature is in order. But I'm getting ahead of myself. I saw the Dance of the Sugar Plum Fairies video for this, and I remember you pining after this one. I was wondering if you got your grubby biscuit-snatchers on it. Nice. We get Victory down here, but I doubt we'll see this one, unfortunately. If it's Victory, I'll probably be able to get it. The brewery is less than 20 minutes away, so I pop over pretty frequently. They said this would be getting limited distribution, but I've heard conflicting reports. At first I heard only PA and NJ would get some, but I read somewhere that some other states might be getting some too. So happy hunting! This page contains a single entry by Mark published on December 23, 2012 8:17 PM. Three Floyds Alpha Klaus Christmas Porter was the previous entry in this blog. Samichlaus Helles 2007 is the next entry in this blog.